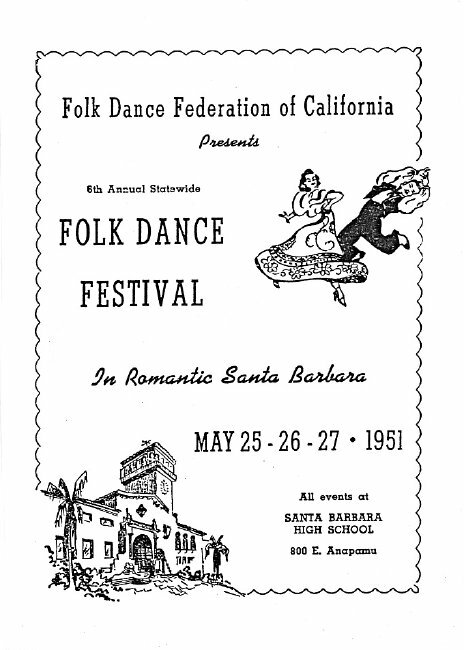 Santa Barbara was awarded the 6th Annual Statewide Festival in 1951 with Bill Herlow again the acting chairperson. The 1949 Festival in their city had been such a success, we looked forward to another great time. Mom's Place for extra curricular activities was much on our minds but alas, it was not to be for our favorite club was no more. It was closed. During the Monterey Evaluation Meeting it was generally agreed that the Memorial holiday was a most suitable time for future Statewide Festivals so the days scheduled for 1951 were May 25, 26, and 27. The Friday night Evening Party was held in the High School Gym as was the Teacher's Institute Saturday afternoon. Remembering the crowd problem in Monterey, this Institute was restricted to leaders and teachers only. Apparently not too many people read the rules as the turnout was quite large but the large Gym took care of things quite well. One of the bright spots of the Institute was our introduction of the lovely lass from the Emerald Isle, Una Kennedy, who taught several dances in a style only Una Kennedy could. Her big hit was "Stacks of Barley." Other teachers in attendance were Lucile Czarnowsky, Carolyn Mitchill, and Paul Erfer, who taught the Swedish dance "Snurrebocken." 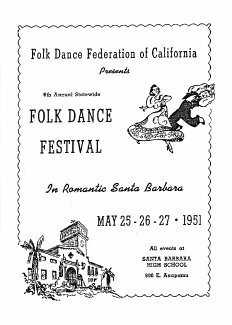 During the past several Statewide Festivals, our repertoire of dances had become greatly expanded. The High School Gym was also the scene of the Saturday night Party. New square dance callers were beginning to enter the scene. One of the best was Bill Castner who would shortly be president of the Federation, North. George Merton of the North and Harold Comstock of the South were the present presiding presidents. Following the Sunday morning Evaluation Meeting, the main festival took place Sunday afternoon at the High School stadium. Dancing outdoors was still popular, and we owed thanks to Bill Herlow and his committee.